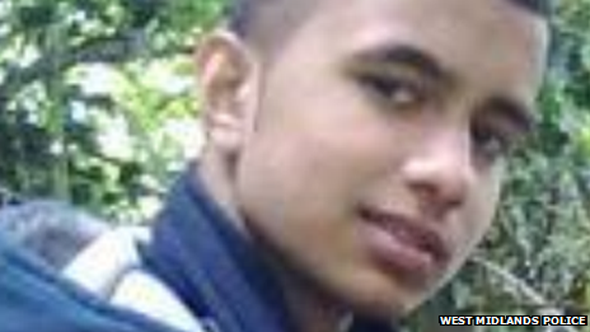 A teenager has been found guilty of murdering a 15-year-old in a park in Birmingham. Hassan Mahmood was attacked in Oaklands Park, Yardley, on 15 July and died in hospital from a single stab wound to the back. A 17-year-old was found guilty at Birmingham Crown Court, but a 16-year-old boy, accused of assisting an offender, was cleared. The 17-year-old, who cannot be named, will be sentenced on 28 February. He had admitted stabbing Hassan but claimed he did not intend to kill him. Speaking after the verdict, West Midlands Police's Det Insp Warren Hines said: "Hassan went to the park that day expecting a fist-fight with another teenager to settle their differences, but by arming himself with a knife the defendant knowingly raised the stakes and it ended in a young lad losing his life." He added that the 17-year-old killer had intended to cause serious harm, and showed a lack of remorse which was "sickening". "He seemingly relished the opportunity to brag about what he'd done after he was arrested and told officers he expected to be released without charge because they wouldn't be able to find the murder weapon."